LINK delivers real-time operational plant data into the hands of managers and executives. On March 5, SafetyChain software, a leading quality management system for food and beverage companies, unveiled SafetyChain LINK, its new business intelligence module which connects managers and executives with their food facilities’ real-time performance metrics. LINK is designed to work seamlessly on any device or screen providing critical real-time data in the office or on the go. This innovative tool consolidates, analyzes, and delivers critical control point data to support operational monitoring and improved decision-making. 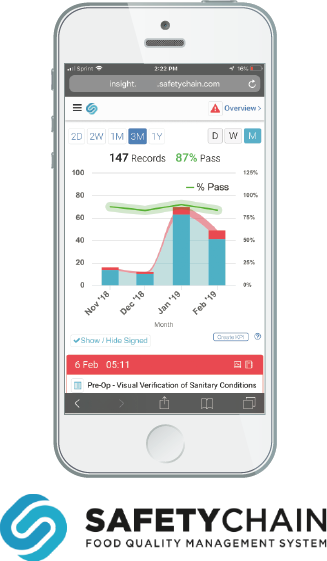 LINK gives users an at-a-glance look into their most important safety, operational, and quality data. With one tap, managers can view a summary of performance and out-of-spec occurrences by location, program, month, day, and shift just to name a few. LINK is the latest tool in the SafetyChain suite of food safety and quality solutions that continues to deliver innovative, value-added features that help its customers manage and grow their businesses. LINK is now included as an integral component of the SafetyChain platform and is exclusively available for SafetyChain customers. To see LINK and all of the powerful features of SafetyChain in action, contact SafetyChain today, https://info.safetychain.com/demo-request. SafetyChain is a Quality Management System (QMS) that helps food and beverage companies improve productivity, profitability, and compliance with a flexible, user-friendly software platform that captures, manages and analyzes real-time operations data. Learn more at https://safetychain.com.